Hello there! 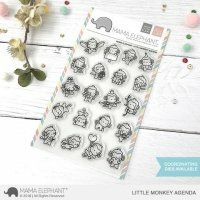 It was really sunny this weekend in Austria so I was in the mood for some Hula dance ;-) Even though it's an older stamp set - I think the 'polynesian paradise' set from My favorite things is just too cute! 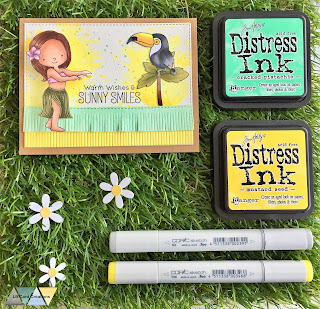 I created a quick distress ink smooshing background (with mustard seed) and diecut the 'mini fringe' out of cardstock. I had used again mustard seed and cracked pistachio distress ink to color in the cardstock before diecutting. Then I colored the images with Copic markers. 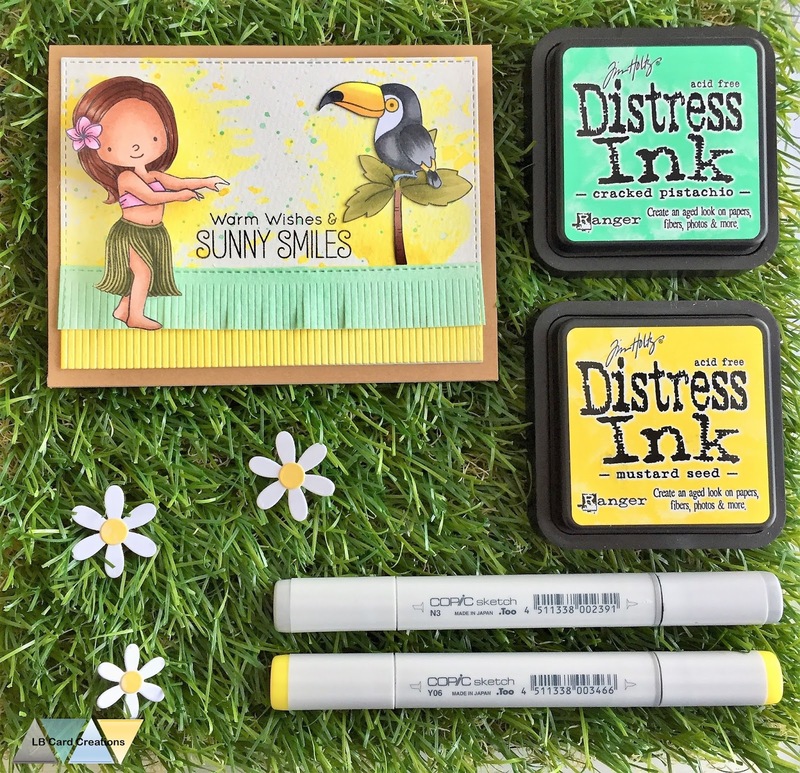 The palm tree is from the 'jungle vibes' stamp set. 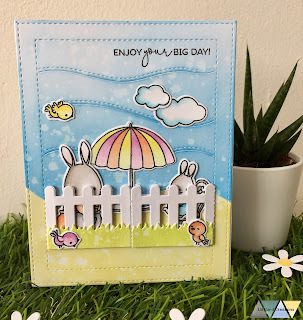 After fuzzy cutting the images I adhered the tucan and palm tree with liquid glue and the hula girl with an action whobbler to the card. The action whobbler was just perfect for the sweet dancing girl! I hope you have a great day and thank you for stopping by! Hi everyone! 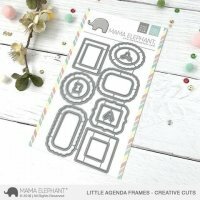 Mama Elephant nailed it again with those cute monkeys and coordinating frames for the little agenda series. 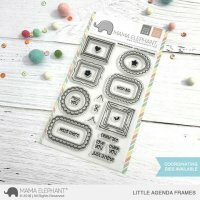 I love that you can use the frame dies for the outside and inside frame separately - so you have all possibilities! 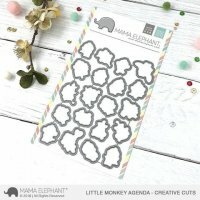 I created those cute pictures with the 'little monkey agenda' and the 'little agenda frames' stamps and dies. 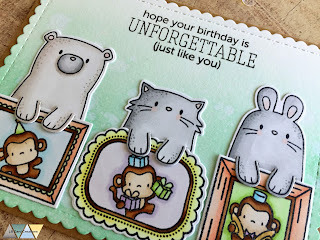 I also used the 'page huggers' for the cards. All the images are colored with Copic markers. The background is very simple - I just applied some cracked pistachio distress ink and scattered water droplets. 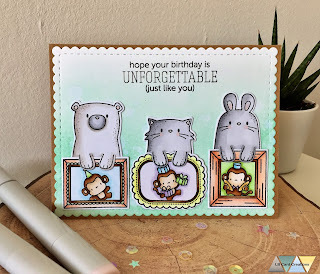 Due to the large images I thought that there shouldn't be too much in the background or the card would be overloaded. 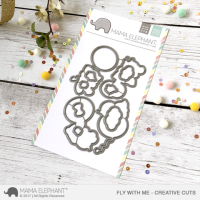 For the sentiment I chose the older Mama Elephant stamp set 'Ella and friends'. I thank you for stopping by and wish you an awesome day! Hi everyone! Finally I share another card. 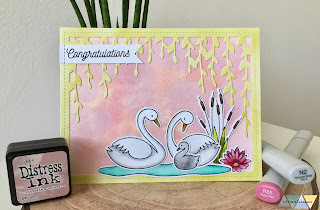 I needed a baby card for my sister's friend and I think the 'splendid swans' from MFT is perfect for it. 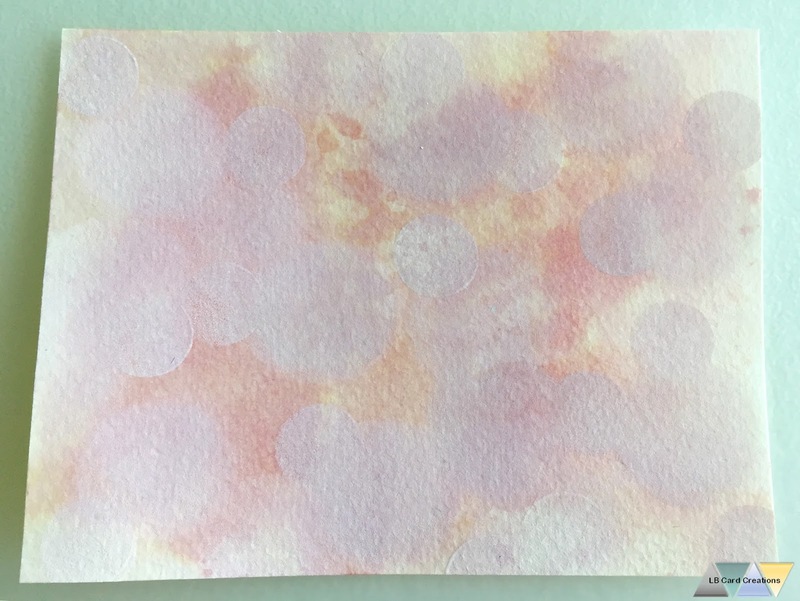 So I created a watercolor (bokeh) background with distress inks. 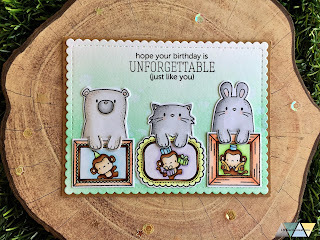 And diecut the 'bayou backdrop' die from Lawn Fawn. 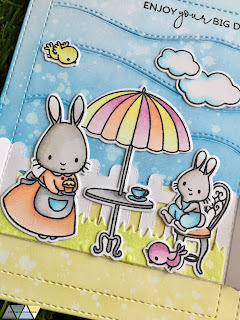 I used the peeled paint distress oxide ink to color the piece of cardstock in. 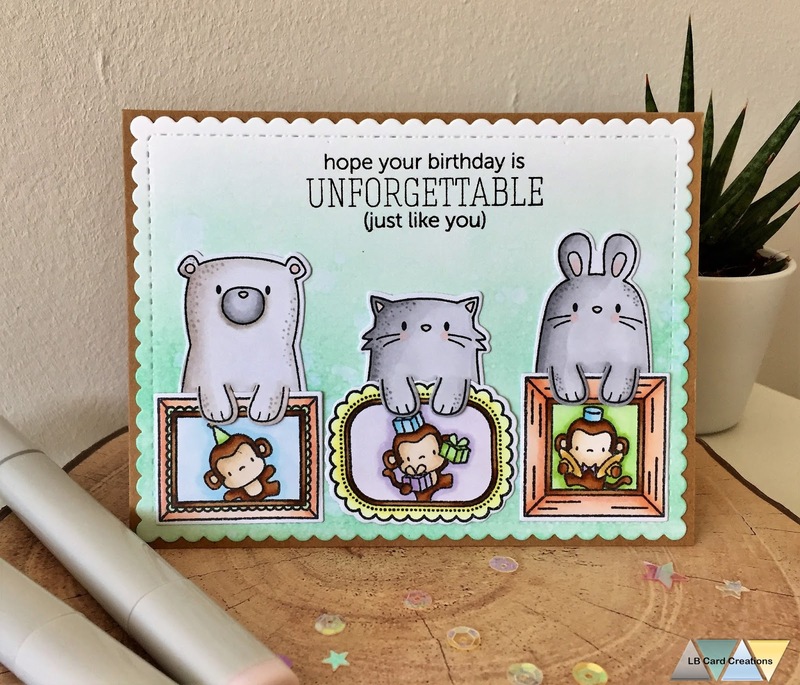 After adhering the pieces to a cardbase I stamped the images with Memento tuxedo black ink and colored them in with Copics. After diecutting and glueing them onto the background, I created a small flag for the sentiment. 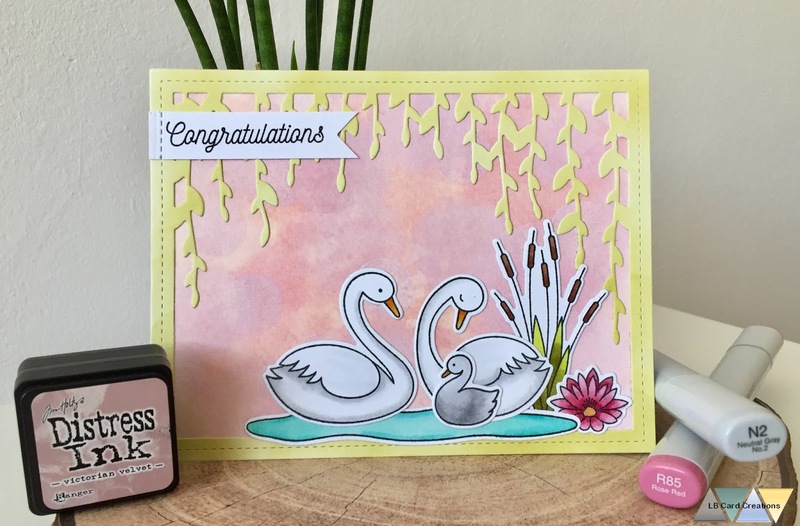 A quick and easy but very cute card with the sweet baby swan. I am back with a springful card because since Sunday was quite stormy today it's really warm and sunny. First I created a background using the 'hillside cover' die from Mama Elephant (as are the rest of the stamps/dies) and distress oxide inks (salty ocean and peeled paint). 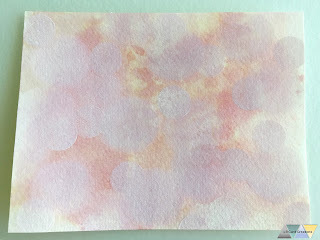 I blended them onto the white cardstock in a very light way and sprinkled some water droplets. Then I diecut the 'inside pop fence' and the grass from ink blended cardstock. After adhering the diecuts to the background I stamped the images from 'tea with friends' and the clouds from 'fly with me' with Memento tuxedo black and colored them in with Copics. 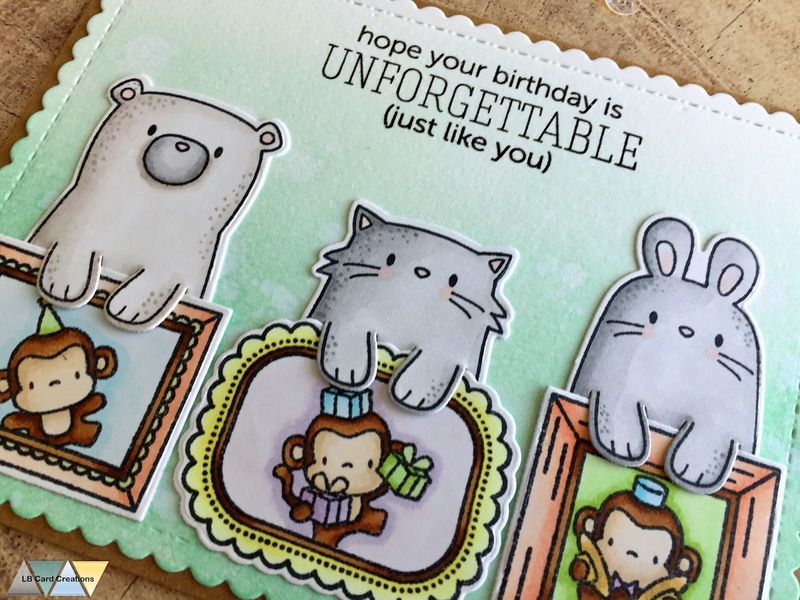 I diecut the images and adhered them to the card. 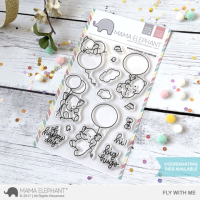 I also added the sentiment included in the set. 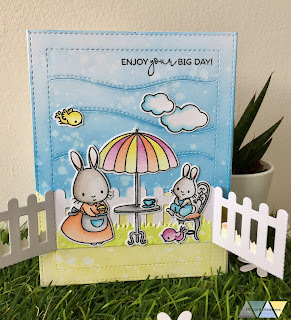 Last but not least I added some shine with the clear wink of stella brush and made two tiny glue dots behind the fence with the mono multi liquid glue from Tombow. 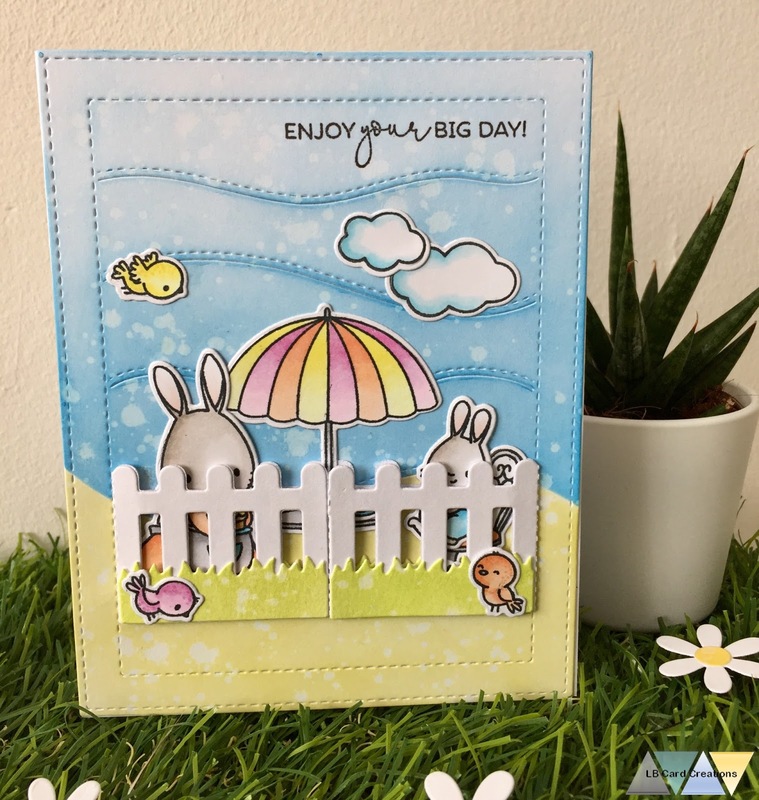 These dots allow the garden doors to close and stick to the background very slightly (before closing the doors the glue must be dry!!!). The doors then can be opened and closed as often as you want. Thank you for stopping by and have a sunny day!